Just like the last two provincial championship ties between this pair, there was just a single goal registered but we had to wait until the 74th minute to see a net dancing today in Castlebar. The delay could not conceal the significance of Johnny Heaney’s strike. In a game where defences were not easily prised apart, Heaney had the first clearcut chance to test either goalkeeper. He made no mistake in slamming a shot to the roof of the net but the role of substitutes Adrian Varley, Ian Burke and Seán Kelly in piecing together the move indicated just how much value Galway got from their substitutes. They needed to be patient on a tough day for attacking play and got their reward with that late goal. For the first time since 1984, the Galway football fraternity are experiencing the happy feeling of having conquered Mayo three years on the bounce in Connacht battles. It’s an impressive rate of consistency considering the stature of this Mayo team and shows Galway are backing up previous triumphs rather than letting them stand as feats in isolation. The stranglehold Mayo enjoyed in Connacht between 2011 and 2015 has been broken. Galway must now aim to finish the job in a meaningful fashion by claiming silverware but defeating the All-Ireland finalists from the last two years, for the third time in championship in 23 months is a really positive start to their campaign. All of Mayo’s careful planning on how to approach this clash was scuppered when a red card was brandished towards Diarmuid O’Connor in the 28th minute. He could have little complaint with Conor Lane’s decision but it was a significant blow and the personnel deficit meant they had to alter the terms on which the match was played. Mayo could not allow the match turn into an open contest and they drew on all their resolve and nous to hang grimly in contention. Shortly after O’Connor’s dismissal, Mayo slipped two points behind but it was a credit to their ability to dig in that they never trailed by a margin greater than a point during the second half until Heaney raised the green flag. It appeared as if Mayo’s resilience would be rewarded as the match seemed set to drift into extra-time but ultimately they were hurt by being cut to 14 men and the change it necessitated in their set up for the rest of the encounter. Mayo operated without 2016 Footballer of the Year Lee Keegan today due to a busted shoulder and then the pre-match news of changes announced that captain Cillian O’Connor would start on the bench after his recent schedule was curbed by a hamstring injury. The Ballintubber man would be introduced in the second half to offer creativity and a scoring touch to their forward line but his county need him powering at full tilt at 70 minutes. The selection headache increased for Stephen Rochford with the sight of two important players leaving the pitch during the action – Diarmuid O’Connor set for suspension after his first-half dismissal and Tom Parsons set for the treatment table after incurring that severe leg injury. The absentees mount for Mayo as they head towards the qualifiers. It’s been a while since the opening Gaelic football shots fired in a province have been so eagerly awaited. There was huge anticipation before the collision of Galway and Mayo, the stadium in Castlebar heaving come throw-in with 29,449 packed in to have a look at this Connacht opener. But the product delivered was underwhelming. The tightness was to be expected yet the game descended into a slugfest in the second half. The sending off of Diarmuid O’Connor did alter the landscape and contribute to the caution that entered the play. It was tense and tactical in the finale but the fireworks plenty had hoped for never materialising. Email “5 talking points after Galway and Mayo's early summer Connacht showdown”. 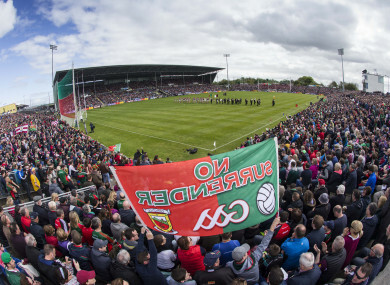 Feedback on “5 talking points after Galway and Mayo's early summer Connacht showdown”.